SerraGold is a proteolytic enzyme blend that contains serratiopeptidase, or serrapeptase, as it is sometimes called. It represents one of the most potent enzyme formulas available in the category. SerraGold has been formulated using the potent serratiopeptidase enzyme and Enzymedica’s unique protease Thera-blend and is intended for those seeking the highest potency serratiopeptidase available. Serratiopeptidase was originally discovered in the digestive tract of the Japanese silk worm but is now derived from the bacteria of the genus Serratia. Because serratiopeptidase is a proteolytic enzyme, it has the ability to survive the digestive tract and remain active while circulating throughout the body. The minerals found in SerraGold make taking a high dose proteolytic formula easy on the stomach. It consists of calcium / magnesium ratio of 2:1 along with numerous trace minerals. Serratiopeptidase, also called Serrapeptase, is a protein-digesting enzyme studied for its numerous health benefits for circulation and healthy inflammatory response. SerraGold is a proteolytic enzyme blend featuring Serratiopeptidase. 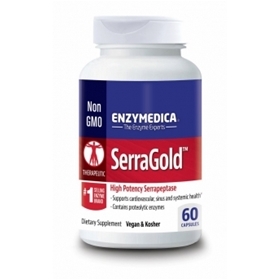 SerraGold represents one of the most potent enzyme formulas available in the category. Recommended Usage:Take 1 capsule daily before bed or upon rising. More may be taken as needed or as recommended by a health professional.